American media are speaking a lot about her, she is the first Hindu ever elected to the US Congress. She will be 39 on Inauguration Day in 2021, and if elected that would make her the youngest president in American history. 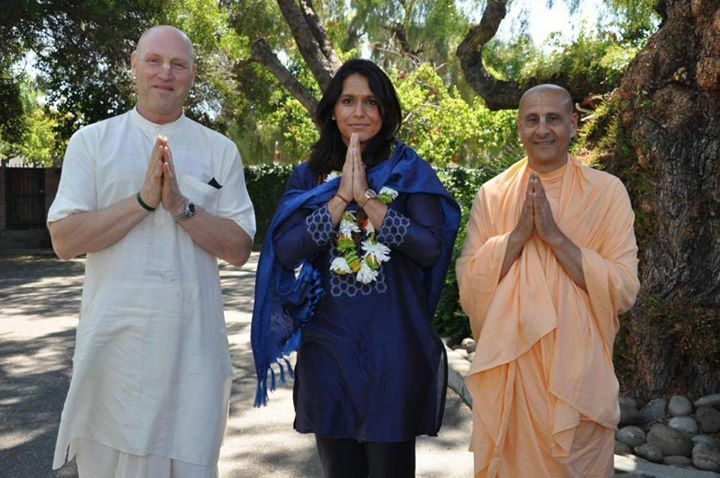 She mentioned health care access for all American citizens, criminal justice reform and climate change and said a central issue for her is that of “war and peace.” Tulsi Gabbard describes herself as a “Vaishnava Hindu” and is a devotee of Lord Krishna. In 2013, she was the first Congresswoman to swear on the Bhagavad-gita (Srila Prabhupada’s Bhagavad-gita as it is). On September 13th, 2016, Tulsi attended the ISKCON 50thAnniversary Gala Event in Washington D.C., along with many other vips including government representatives, political leaders, religious leaders, and academics.